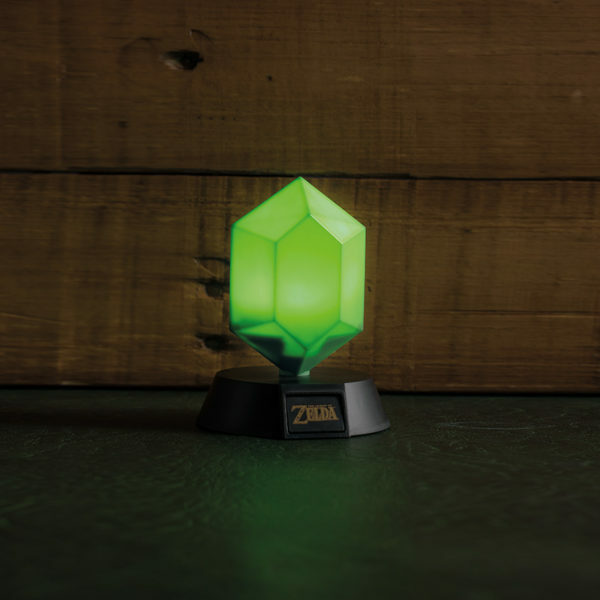 Light up your room with an iconic symbol from the hugely popular Legend of Zelda! The Legend of Zelda Green Rupee 3D Light takes its distinctive 3D design from the green coloured rupees found throughout the Legend of Zelda series of games. Measuring approximately 10cm from base to tip (approx 4″) and powered by 2 x AA batteries (not included), the Legend of Zelda Green Rupee 3D Light is a perfect addition to any fan’s bedroom. First released in 1986, The Legend of Zelda has become a hugely successful and highly influential franchise within the games industry, spawning numerous sequels, prequels and spin-offs, including Ocarina of Time, The Wind Waker, Tri Force Heroes and Breath of the Wild. The fantasy adventure has even included various cartoons and comic books, meaning the characters of Link, Princess Zelda, and Ganondorf have become household names to fans, and are some of the most popular video game characters of all time. Largely set in the realm of Hyrule, the adventure predominately centres around Link, and his efforts to capture the Triforce and save Princess Zelda. Great for fans and gamers, The Legend of Zelda Green Rupee 3D Light is an officially licensed product, and is an ideal gift solution for birthdays, Christmas stocking fillers or even the office Secret Santa.